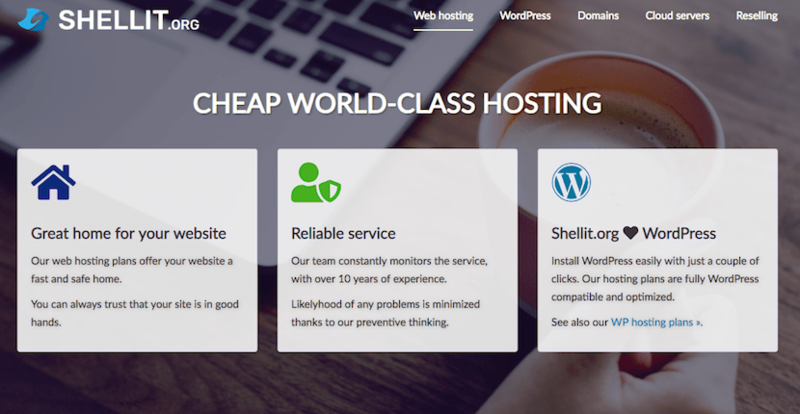 Shellit Review 2019: Is Shellit a Good Hosting? Shellit is a Finnish website hosting provider. They offer a reliable service using uniquely located servers in a Tier III data center. Since 2007, Shellit has worked to provide high quality but low-cost website hosting services to their customers. Currently employing seven people, they own their own servers which are housed in a datacenter uniquely built into a cave in Ulvila, Finland. Their website and support are available in both Finnish and English. Unlike most website hosting companies, Shellit does not advertise their uptime on their website, nor do they have an uptime service level agreement. Customer service did advise me that on average, their uptime is between 99.9% and 100%. Whilst this is likely sufficient in reality, it would be nice to have some form of guarantee in place. Again, whilst not advertised on their website, their customer service advised me that their data centers are Tier III, which means they do not exceed 1.6 hours of downtime each year and they have a minimum of 72 hours protection in the event of a power outage. Interestingly, their data centers are housed inside ex-army barracks in a cave in Finland! Apart from the unique fortification of the server location, they also offer several top quality hardware features including SSD storage for faster website speeds, IPv4 and IPv6 technology, Juniper switches to enable automation and full control of each module, and optical fiber connections to enable high gigabit speeds. WordPress users and new website owners should also consider Shellit’s dedicated WordPress packages that come pre-installed with WordPress and automatic WordPress updates. It’s a really easy way to get started with a new website. Whilst their shared hosting plans are fairly comprehensive and include up to 1000 GB bandwidth and 20 GB disk space with optional additional domains, when you’re ready to scale up your online presence they also offer scalable NVMe, SSD, and HDD cloud servers plus servers for resellers. Shellit’s pricing is comparable with other Finnish companies, but high compared to international companies. That said, even their basic package comes with satisfactory 5 GB disk space and 50 GB bandwidth, as well as an SSL certificate and free domain, which makes it quite a substantial package. Their minimum term is one year, which increases in one-year increments up to a maximum of five years, but with no discounts for longer terms. Unfortunately, they do not offer a no-obligation monthly plan, but this is mitigated by their 14-day money-back guarantee that allows you to test-drive their services. Their customer service options are somewhat unique. They offer live chat, telephone, and email, which is all great, but their business hours (including sales and support) are very limited; 10 pm to 3 pm from Monday to Friday. To make matters worse, it costs almost one euro per minute to call them. On the plus side, I found their technical support staff to be helpful, polite and knowledgeable when I contacted them via live chat. They also have a helpful knowledge base. Shellit is an award-winning company with stable Tier III hardware, an easy-to-use cPanel control panel, and environmentally friendly servers. A good choice for customers looking for reliable servers located in Finland. Wondering how Shellit stacks up against other Web Hosting companies? Enter any other Web Hosting company and we will give you a side-by-side comparison.